As a dietary supplement, adults take one serving (2 Capsules) in the morning on an empty stomach or as directed by a licensed physician. Do not exceed recommended dose within a 24 hour period. To avoid sleeplessness, do not take within 4 hours of bedtime. Seek advice from a physician before consuming this product. Do not exceed recommended dosage. Do not use if you are contemplating pregnancy, pregnant, nursing, prone to dehydration, or exposed to excessive heat. Reduce or discontinue use of this product if sleeplessness, tremors, dizziness, nervousness, headaches, or heart palpitations occur. This product is only intended for use by healthy adults 18 years of age or older. Discontinue use two weeks prior to surgery. Keep out of reach of children and pets. Store in a cool dry place away from direct sunlight. Consumer is responsible and assumes all risks, liabilities, and consequences related to the use of this product, including compliance with the rules and regulations of all governing bodies or other entities having jurisdiction over any sport or athletic activity in which he/she participates, as well as any career regulations. WARNING: Not intended for use by persons under age 18. Do not exceed recommended dose. Do not consume synephrine or caffeine from other sources, including but not limited to, coffee, tea, soda and other dietary supplements or medications containing phenylephrine or caffeine. Contains caffeine. Do not use for more than 8 weeks. Consult with your physician prior to use if you are pregnant or nursing, or if you are taking medication, including but not limited to MAOI inhibitors, antidepressants, aspirin, nonsteroidal anti-inflammatory drugs or products containing phylephrine, ephedrine, pseudoephedrine, or other stimulants. Consult your physician prior to use if you have a medical condition, including but not limited to, heart, liver, kidney, or thyroid disease, psychiatric or epileptic disorders, difficulty urinating, diabetes, high blood pressure, cardiac arrhythmia, recurrent headaches, enlarged prostate or glaucoma. Discontinue 2 weeks prior to surgery or if you experience rapid heart beat, dizziness, severe headache or shortness of breath. As a dietary supplement, adults take three (3) capsules, two times daily, once in the morning, once in the afternoon. On training days, take 30 minutes before workout. DO NOT EXCEED 6 CAPSULES IN A 24 HOUR PERIOD. Do not use for more than 8 weeks. Read entire label before use and follow directions. This product NOT for use by individuals under the age of 18. Do not use if pregnant, nursing or allergic or contraindicated to aspirin. Do not consume synepherine or caffeine from other sources, including but not limited to, coffee, tea, soda and other dietary supplements or medications. Consult your physician before use if you have, or have a family history of a medical condition, including, but not limited to, heart disease, diabetes, high blood pressure, depression or other psychiatric condition, glaucoma, or seizure disorder, cardiac arrhythmia, recurrent headaches, enlarged prostate or if using a monoamine oxidase inhibitor (MAOI), lithium, ANY prescription drug (such as anti-depressants, blood thinners, or nonsteroidal anti-inflammatory drugs) or over the counter drug including aspirin or products containing phenylephrine, ephedrine, pseudoephedrine, or other stimulants. Discontinue 2 weeks prior to surgery or if you experience rapid heartbeat, dizziness, severe headache, shortness of breath or upset stomach. KEEP OUT OF REACH OF CHILDREN AND PETS. Store in a cool dry place (60°F - 80°F). (State of California Prop 65) This product contains a chemical known to the State of California to cause birth defects or other reproductive harm. Consumer is responsible and assumes all risks, liabilities, and consequences related to the use of this product, including compliance with the rules and regulations of all governing bodies or other entities having jurisdiction over any sport or athletic activity in which he/she participates, as well as any career regulations. Final Cutz has been designed to support the fat burning process while assisting with your focus, concentration and overall sense of clarity. 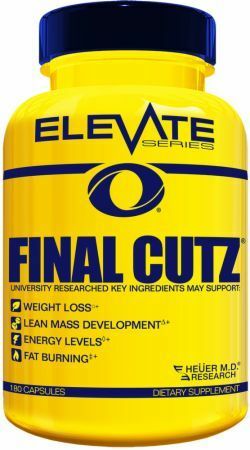 The addition of Acetyl-L-Carnitine makes it possible for lipids to be more effectively transported into the cells to be used as an energy source.